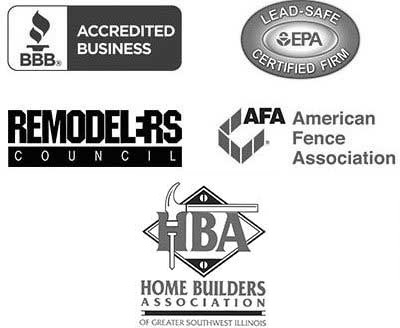 There are many deck contractors serving homeowners in Waterloo, Illinois, but no other company matches Chesley Fence & Deck’s commitment to customer satisfaction. We ensure each customer gets the greatest value for their investment, as well as a decking solution that is tailored to their specific needs and budget. For example, for those who want a cost-effective deck, we offer treated lumber or premium cedar. We also offer a selection of composite options, such as our Tamko EverGrain® Envision ® PVC coated composite. This type of decking is superior to what other deck contractors in Waterloo, IL, install because it is extremely resistant to fading, warping, staining, and deterioration, and is a low-maintenance product that will never need to be painted, stained, or sealed. If you’d like to learn more about what makes Chesley Fence & Deck one of the best deck contractors serving Waterloo, IL, and the surrounding areas, contact us today.